The Global Catholic Climate Movement (GCCM) is proud to announce the release of the Eco-Parish Guide for Catholic Parishes. 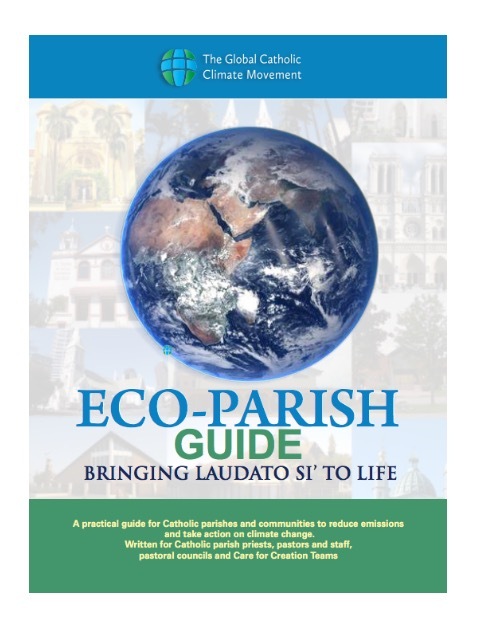 This free guide will be a great resource for your parish to bring Laudato Si’ to life. Also, if you are an active member of your parish community, sign up to participate in our upcoming global network of Eco-Parishes! Stay connected with us and upcoming Eco-Parish initiatives by registering below. The GCCM Guide is written for parish priests, pastors, deacons and staff; for pastoral councils and green teams, and for parishioners who would like to get involved in the parish work on climate change. HOW MUCH will it cost my parish to take action? The GCCM Guide offers many climate actions that can be taken with no budget, no experience, and no special expertise. The actions can be taken in any order and in any combination. WILL you translate the Guide? Yes, the GCCM Guide translations to Spanish and Portuguese will be published very soon. WHAT is the Eco-Parish Global Network? The Eco-Parish Global Network is an upcoming initiative by GCCM, to bring together parish « Green Teams » from different countries to share experiences about how to bring Laudato Si to life and provide new resources to take action (note: if you are in the U.S., such a program already exists: the Care for Creation Teams of the U.S.-based Catholic Climate Covenant). The GCCM Guide is inspired by Pope Francis’ 2015 Encyclical, Laudato Si’, On Care for Our Common Home, and fully aligned with the Catholic Church’s formal statements and position on global climate change. Download « 10 Things a Catholic Diocese Can Do » here. Other parish resources are available here.